After hearing that teammate Jimmy Butler had removed his rear-view mirror as a symbol to never look back, Derrick Rose’s competitive nature might have gotten the best of him. Rose removed his left leg as a symbol to never look down. “Well you know, I think driving without a rear-view mirror might be dangerous. But it definitely can’t be as dangerous as driving to the basket with knees like mine,” Rose explained. “And I’d like to clarify that I am definitely the brace of this franchise,” the 2011 MVP added. 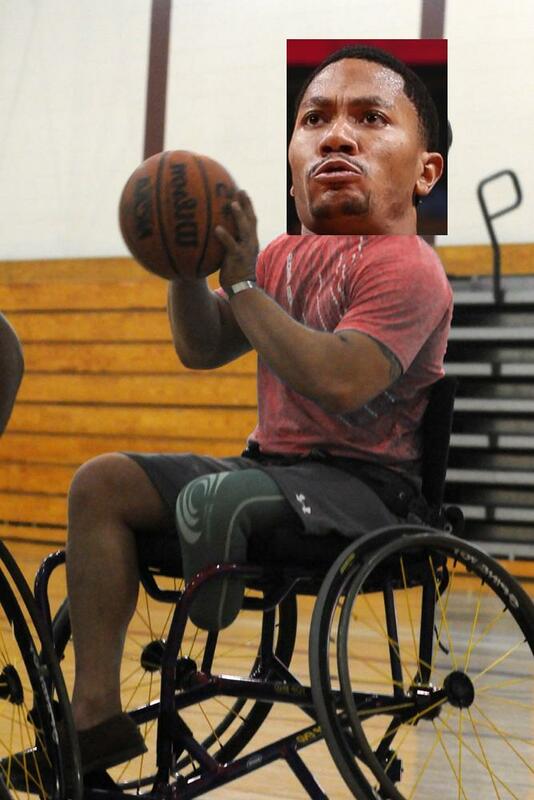 Pictured: Derrick Rose leans back into a fadeaway. Reactions from Derrick’s teammates were mostly poor. While many projected that his high-arcing floater and strong basketball IQ might still be helpful, the general consensus was that Rose was getting a little weird about his personal insecurities. “I’m not sure if our team can handle an extra perimeter defender who’s always on skates,” admitted Doug McDermott. “Me parece un desastre,” added Pau Gasol, who was so distraught he was unable to communicate in English. Jimmy Butler himself was amused by the situation. “Derrick is the zero this city deserves, but not the one it needs right now,” he said.